It´s a very impressive day for all the Verge holders and investors. More than 50 percent in the last 24 hours. I hope this run is only the beginning and will not stop in the next weeks. People, please tell me, what is so valuable in this coin so it reached billion cap again? Is this growth because of scheduled unknown partner announcement? Look further for some low cap coin to invest into. This one is overhyped, overpumped. Do you really believe that XVG has natural growth today? Bots are workig hard to create what we see. I am a Ro-bot. beep. hi, i cant find any Lyra2rev2 pool for this coin, with hashrate, any tips pls? Any1 heard of rumors about XVG and Amazon partnership? Why would verge be partner with Amazon. It will be Like Money Gram or Western Union I think. I heard about that news from one of my friend that it will partnered with Amazon, I searched for it but still not found as the developers has kept it a surprising secret and they told that their upcoming partner will announce that in their own big conference. So I am confused that who will be their partners for which the developers are much happy and they are saying that they got the success. Can we invest in this secreted news! I am confused that how much will be there success. Can anyone help ? I installed the 'Windows Electrum Wallet' but it will not connect to the network, I've given it access through the firewall but still no network connection, how do I get it connected ? Thanks, that worked. I used the 'e3.verge-electrum.com port:50002' it finally connected after many false starts with all 3 suggested nodes, it still keeps jumping from "Balance: 0.00 XVG" to "Not Connected"/"Synchronizing..." every few seconds, is this normal ? jah jah das is goot. This is the problem, people will guess between now and the 16th April and the price will react to those guesses. The price shot up yesterday on the back of the Amazon Rumour. There was no reason at all for the price rise yesterday which means it will be followed by a dip. Verge rose on the back of the 'crowdfunding' last week, then dropped after they announced there would be an announcement yet it then shoots up yesterday with no news. That aint right and you know that will be followed by a drop. And not long after writing it the price drops. I am very careful and I study the charts and do my homework. 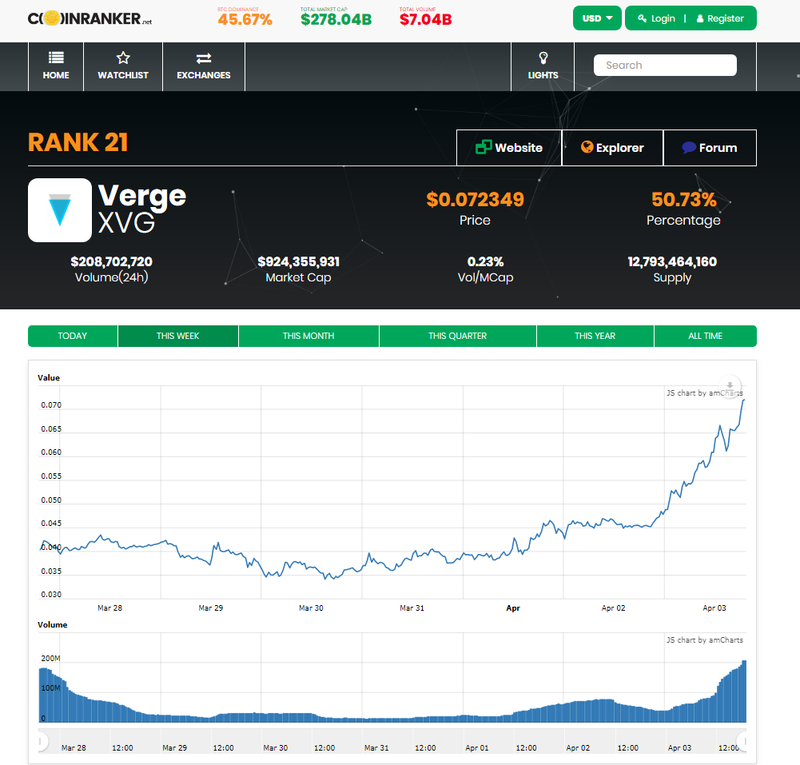 I have been a big supporter of Verge for ages and that's why it is important to ive hints where we can why things go up and down. it shouldn't take 5 days after an announcement about an announcement coming for it to shootup. The news will be good for Verge but leading up to it we will see swings up and down for whales to fatten their stacks for that announcement.